As we know, I haven't registered for fine china b/c I am inheriting my mother's Lenox China that she received back in the 70's - but after looking at some of these beautiful patterns from Lenox, I'm wondering - can i have two sets of amazing china? We all know when it comes to fine China - Lenox is a name that everybody knows. From its lifetime warranty to its beautiful design and durability... there is quality behind the name Lenox... so without further ado... a few pictures and then details on how to enter! · Blogging about the contest and linking to the Lenox web site and leaving a comment here with the link to that contest. Winners can be from US & Canada! PLEASE Make sure you leave contact info so that i can contact you if you win! The winner will be chosen by random.org. I'd love to read about your personal experiences with Lenox or how you envision using this China to create memories with your loved ones. we've just decided to register for "opal innocence" as our formal china! i can't wait to display it! i've also been a follower of your blog and on twitter. 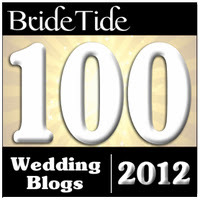 i can't get enough of relentless bride and lenox! we're planning on selecting another lenox pattern, tin alley, for our more everyday set. thank you so much! i like the scroll one. it is nice. it has a butter plate. I love the Lenox Opal Innocence Carved. I imagine us coming home from our honeymoon and using our new Lenox china for the first time as a married couple. For some reason I see this set looking beautiful for brunch with some bright yellow sunny side up eggs and blueberry pancakes. I think any food would look better on this set and of course I always imagine beautiful fresh cut flowers maybe in a Lenox white pitcher. I LOVE the Opal Innocence. I thought I liked the Scroll better, but I think I just like the teacups in that pattern. I wish I had the kind of family that would warrant the use of china such as this. The whole point of it would be lost on my Al Bundy/Uncle Buck father. LOL. My MIL has beautiful Lenox China...in her china cabinet. We use paper plates for holiday dinners at her house because she says her dishes need to be washed by hand. Oh...did I mention their dishwasher has been broken for the last 15 years so everything gets washed by hand anyway. I hope to raise my daughters to value the lovliness of using the good china. Perhaps one day I'll be able to enjoy Christmas dinner at one of their homes on a pattern such as one of these instead of on a paper christmas tree that I have to quickly eat off of so nothing leaks through onto the actual tablecloth under the "dish". I LOVE the Opal Innocence Carved. 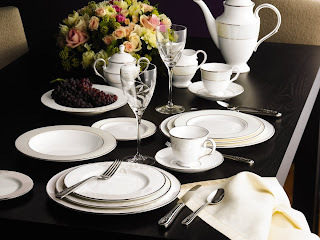 Classic white china never goes out of style, but the detail of this set is the perfect touch! The Opal Innocence is my favorite - classic and elegant! 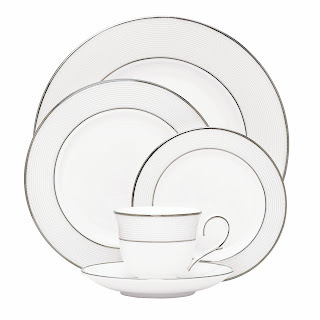 And (because I am bored at work and really really want this china), here is how I would use the Lenox place settings. My fiance and I love to surprise each other with cooked meals. So far, many of these meals have been presented on typical college student dishes from such places as the dollar store (mine) and Walmart (his). I would love to make him one of my specialties (maybe European-style crepes with homemade raspberry jam?) and serve it on this china. And I am sure his recipes, like an amazing Mediterranean/Southwestern salad with hummus and guac, would look and taste even better on these plates as well! I adore the Opal Stripe collection! This design suits us well because we are very laid back and simple people, and a simple stripe pattern is so classic. I don't know why Koreans rave about Lenox over other brands(esp the Butterfly set-French country?) but I do like the opal innocence's clean and stylish design. I like you, am also inheriting some china. I think the Opal Innocence carved would make an awesome addition! Then we would have two place settings that were truly "ours"
I think the stripe 5 piece is beautiful- would love to entertain with it!! the opal innocence is SO PRETTY. very understated and elegant! it has the faintest color to the border, and the white designs make it look so elegant and classy! i would totally have a cupboard just to show off the china, and then bring it out to amaze my family and friends! I like the Opal Innocence Stripe Collection. It is so classic. I also like the Stripe version, probably because it is similar to the Federal Platinum I've always loved. Ooh, I like the "carved" line -- I hadn't seen that before! I've always loved the Opal Innocence pattern, but the original (rimmed) line was just a little too fancy for us (and we don't need fancy china). The carved line could totally be used on an every day basis! The one thing we did splurge on was buying a pair of the Opal Innocence champagne glasses as our toasting flutes for our reception -- they looked great in our pictures! I love the "opal innocence"...so classy. we hope to display this china in some type of modern hutch (more of a bookcase look) in our dining room. our families have helped us grow up loving lenox... i'm talking full lenox christmas trees, holiday patterns for christmas china, the works, so we want to incorporate lenox as much as (financially) possible! What to do with the china - easy! Have some dinner parties! I would love to host my little brother and his GF, my former band director (and theirs) and our college band director. It would be such a nice, musically stimulating evening! omg is it possible i've been so overwhelmed by lenox love i forgot to leave my email?! I love the basic Lenox Opal Innocence pattern! So classic... Thanks for the opportunity! The Monogrammed ones would be really nice to display. I like mix and matching opal innocence scroll, stripe and carved. Try it! It looks fabulous! 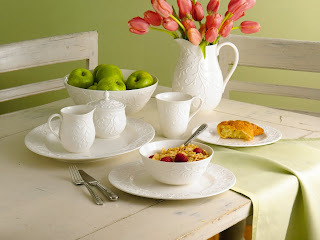 I love the Opal Innocence china. Very elegant! I think I would want a nice set of china to use regularly. Its such a waste when you have "a good set" that never gets used. 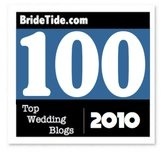 I thought the Solitaire (ivory) was understated and elegant; quite nice! The simple stripe is my favorite...Definitely fits with our style the best! My favorite Patter is the Opal Innocence Carved. It is very elegant but the carving gives a rustic feel that makes it not to stuffy. The Opal Innocence Carved pattern is my favorite of the Lenox! It's so classically gorgeous and understated. It's the perfect canvas for the art of food. It really suits me personally because I am drawn to all things classic and feminine. I don't like anything flashy and always tend for simplistic beauty. I love Lenox because it is what you think of the moment you decide to register for for dishes on your registry. It's classic and strong and I can't wait to get some! 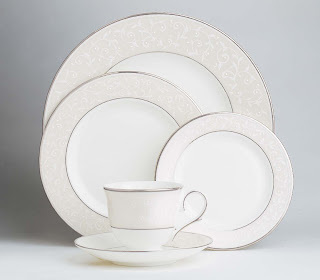 I plan for my Lenox set to be the staple that I reach for everyday when serving dinner to the more special occasions. I think it looks gorgeous with anything on it and will definitely utilize that! I love the opal innocence stripe. It is simple yet elegant! My fiance and I registered for 12 place settings of Opal Innocence. What a beautiful set. It is the perfect blend of modern sophistication and classic elegance. I also love that it has neutral tones. I really love to dress my table in colorful linens - everything will look amazing with this set. Thank you so much for offering this contest! The Opal Stripe pattern is beautiful. Modern and classic at the same time! Have also been following you on FB! I just tweeted from cncliving and have been a follower for a while. I'm also a Lenox fan on FB. I've been a fan of Lenox ever since my best friend registered for Opal Innocence. The clean lines, elegant feel, and quality truly make this timeless. I hope to pass it onto my kids like you do! The classic Opal Innocence - it has the right balance of the ladylike pattern with the more neutral stripe - lovely! We still have our Asian wedding later and would love to receive formal dinnerware. Hopefully we'll have our first house in NYC in the next year! My husband is slowly learning how to cook and nice cookware really invites us to explore our culinary expertise and have people over. Who doesn't like to celebrate friendship with style? I like the scroll- so clean and elegant. this is the most incredible giveaway! Lenox has the most beautiful table settings, it was hard to choose a favorite. My fiancee and I live to eat, as we spend most of our money on fresh garden produce from local farmers (we spend saturdays at farms) and round off the day with a trip to the bakery and cheese shop. we come home and make a beautiful meal and then serve our food on a brand of .50 cent 365 dinner plates (that come from a certain Swedish store which shall remain nameless) and eat our labors. Having a Lenox Opal Innocence Carved china set would make our Saturdays complete. Of course we'd use them every holiday and entertaining event, but their main event would be every Saturday night after our day gathering local food and cooking a beautiful meal, just the two of us. opal innocence stripe is lovely. I plan to use it when we host a fabulous dinner party... or, our favorite cocktails and boardgames night! I want the opal innocence carved ones! I want the carved set to give to my grandma. She never used nice things when we were young and now she can have it and enjoy it! The carved style is her type! I love the beautiful simplicity of the Opal Innocence Stripe set. I would use it especially for when we have dinner parties at our place! we're choosing opal innocence because of its timeless, elegant feel. it could have worked for my parent's china years ago, but it is still relevant today! can't wait to hear the winner! plus, we're registering for our 16 (hopefully 14 if we win) place settings of opal innocence at the next macy's sip and scan event. love lenox! I really like the carved ones. Also a fan on facebook now! I like the scroll design the best, but the carved design is great too! I love the Opal Innocence Pattern! It is so beautiful. My daughter and her fiance registered for 12 place settings! I would love to win this for them!